What’s it like to drive the 2016 Cadillac ATS-V on the street? Don’t know. Don’t care. Didn’t ask. That is not why I’m here. If you want to know what it’s like taking the kids to school or picking up groceries, then you can ask somebody else. I’m just here to tell you what it’s like to wring the neck of Caddy’s upstart BMW M4 challenger on the track. 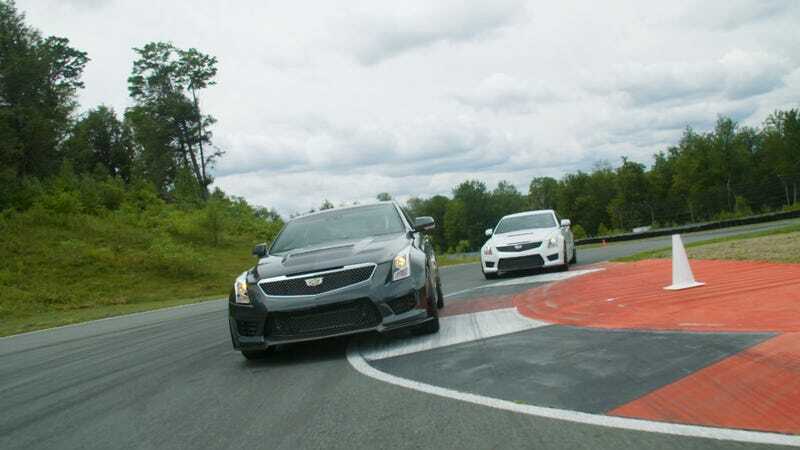 To be frank I was actually more excited to drive Monticello Motor Club, as I heard good things about the circuit, than I was to drive the ATS-V. It’s not that I wasn’t looking forward to driving it. It’s more that the ATS-V had kind of snuck beneath my radar, so I didn’t really have any built up expectations. It’s like that sleeper movie (the original Pirates of the Caribbean comes to mind) that you initially dismiss, but after the buzz continues for several weeks you decide to take a second look and, hey, it turns out to be really great! The ATS-V is the Pirates of the Caribbean of performance cars. And I mean that in the best way possible. Once the Caddy folks released us assembled journalists from our media/safety briefing, there was a mad rush to the door to the paddock where the cars were parked. Being the new kid on the block to these manufacturer media days I held back a bit not knowing what the protocol was. My mistake. Automotive journalists at a manufacturer track day are like Tom Brady on an overinflated football. When the dust settled, the sole remaining car was a rather forlorn looking sedan. Okay, no big deal, it’s the same car so they should handle more or less identically, right? However, a quick look inside revealed why this particular car was avoided like the check. Automatic. Dammit. Way to hose the new guy, Okulski. Resigned to my automatic fate, I gave the car the once over in the paddock and found some encouraging signs. The first being the Recaro sports seats. Firm, supportive and seeming infinitely adjustable (16 way), these puppies were definitely designed with track day use in mind. Settling in, the next bits of news went straight past encouraging and directly to Are You Serious Right Now. As I was looking to find the button to disable traction control, the very helpful Cadillac engineer pulled up the menu display for the Performance Traction Management system. 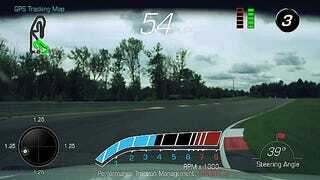 In addition to the standard wet and dry settings, there is an additional track selection with five individual modes to tailor the car to the conditions and the drivers ability. Five track modes! This goes far beyond the standard on and off button thats normally found on even the most focused of performance road cars. Four of the track modes give the driver steps to gradually reduce the amount of interference from fun police, but it was the fifth mode that made me sit up and take notice. Race mode. Basically Race mode sends all of the nannies out for lunch and lets the driver (for better or for worse) have their way. To be frank, I didn’t even see a huge amount interference from the most of the track-focused modes other than a bit of reduction in power mid-corner when trying to use the gas to get a bit of rotation out the car. But that was pushing at 9/10ths. Helpful non-interference is the Holy Grail of electronic traction control. Is this Cadillac there? Not quite, but it’s close. Damn close. So what it like to drive? Well, as I’ve been doing this racing thing a long time, there are very few tracks in the U.S. that I haven’t been to. Monticello was a notable exception. Driving a new car for the first time on a track you’ve never seen before is very revealing. Some performance cars are a bit of a handful to drive quickly. They require a good feel to push them at their limits anything less than 10/10ths and they want to fight you. Trying to learn a new track with a car fighting you all the way usually makes for a long day. So when I rolled out of pit lane, looking to see which way Turn 1 went, I was pleasantly surprised to find the ATS-V to be very easy to lean on very quickly. 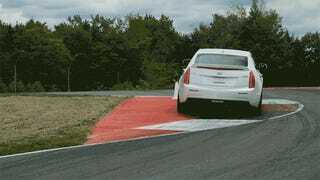 Very well balanced and neutral (meaning no major over or understeer characteristics). More surprising was the way the car seemed to shrink in size once on track. That’s the mark of a good performance car. One of the things that I enjoyed the most was the surprisingly linear response of the twin-turbo V6 engine. Turbocharged cars tend to be notoriously difficult to drive on the limit due the unpredictable response of the turbo; see Porsche 935 as exhibit #1 for this trait. The Cadillac ATS-V engineers have spent some serious time getting this engine to run like a big bore V8. Some people (you know who you are, people) have lamented the use of a turbo engine as opposed to the V8, but those people only like going in a straight line. Going to a V6 allows the engineers to get the weight back further back in the engine bay making for a much better balanced and drivable car. The fact that they’ve made the turbo drive like a V8 is just icing on the cake. The second thing that impressed was the massive front end grip the car delivered. Now some of the credit has to go to the Michelin Pilot Super Sport tires, but even so I was impressed how well the front end hooked up, allowing me to use the throttle to rotate the read and get the car pointed where I wanted it to go sooner. When I did get into the corner a bit hot and overwhelmed the grip available it was a very neutral and balanced slide, more so than massive handfuls of understeer. This made getting the car up towards the limit a fairly straight forward task. I’m thoroughly impressed the this car. What’s there not to like? Well, the styling is a bit weak in my opinion. The front end is great but it looks like they spent all the money on the front end and gave up once they got to the A-pillar. Subjective, I know, but the BMW looks the complete package. Likewise the interior, while miles better than Caddy’s of days gone by, is still not 100 percent up to par with its European competition. Lastly, when driving the automatic and using the paddle shifters there is a disturbing lack of feedback to tell the driver whether the command to downshift has been received. No blip of the engine or audible beep. Its a bit unsettling to come out of a corner and go to throttle not knowing if your stuck in fourth or went an extra gear down to second. But that’s it. Those are my complaints in full. And two-thirds of them are completely subjective. Objectively, this is one of the finest cars to come out of the General Motors stable in a long time. It’s well worth taking a hard look at if you’re in the market. Robb Holland races in the British Touring Car Championship for Rotek Racing. He’s a Jalopnik contributor who basically lives at the Nürburgring most of the year. He is also the tallest man in Germany.